Wearing the Naso Turco mask, you can capture the spirit of the Venetian Carnival at your own masquerade ball. Masquerade full face masks became iconic in the 16th century as part of the annual Carnival of Venice. Mask makers set up around the city especially to create the artistic masks to wear during carnival time. Some masks were flamboyant & over the top, others more plain & restrained. And the most popular amongst them were those designed on theatrical characters. Intrigue prevailed and being part of the Carnival meant being who you wanted to be, rather than who you were in normal everyday life. Today by being invited to a masquerade ball or hosting one yourself, you can replicate the extravagance of the Venetians by purchasing and wearing your own genuine mask from Simply Masquerade. 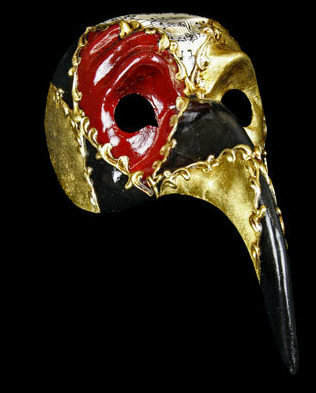 The Naso Turco, like all the Simply Masquerade full face Venetian masks, is 100% original, made by hand in Venice in the time honoured tradition by today’s craftsmen. Look closely to see the brush strokes and paper layers which give away the fact that your mask is not machine made or mass produced. If for your special occasion or themed event, style means wearing an artisan-made mask from Venice then this mask is truly for you. With handmade masks you don't need to sacrifice comfort because the Naso Turco is easy to wear and ties easily with satin ribbons, staying in place all through the party. Your first choice for your masked ball or special event when only authentic Venetian masks will do. Order today. Postage and packing throughout the UK is free & we have great rates for worldwide shipping too!